In the Bible, Josephus, and the Talmud. Monarch of a south-Arabian tribe, and contemporary with Solomon, whom she visited. The Queen of Sheba, hearing of the wisdom and wealth of Solomon, visited him at Jerusalem, accompanied by a brilliant retinue. There she found that his fame, great as it was, fell far short of the truth, and after exchanging costly presents with him, she returned to her own land, marveling at what she had seen and heard (I Kings x. 1-13). According to Josephus, she was the queen of Egypt and Ethiopia, and brought to Palestine the first specimens of the balsam, which grew in the Holy Land in the historian's time ("Ant." viii. 6, §§ 5-6). The country over which she ruled is usually supposed to have been the district of Saba in southern Arabia, but despite thorough explorations by recent travelers and scholars, no reference to any Queen of Sheba has been found in the numerous Sabean inscriptions. R. Jonathan (c. 250 C.E.) asserts that the phrase does not refer to a queen, but to a kingdom, and hence to a king, whose contemporary is said to have been Job (B. B. 15b). These are all the known historical references to the mysterious Oriental princess, and neither of the two Talmuds contains any other allusions. The legends connected with her name seem, therefore, to have originated in Abyssinia, and especially in Arabia, both of which countries were rivals for her renown, and from them the traditions concerning her entered Jewish circles. The kings of Abyssinia trace their descent back to a certain Menelik, the reputed son of the Queen of Sheba and Solomon (Ewald and Winer). 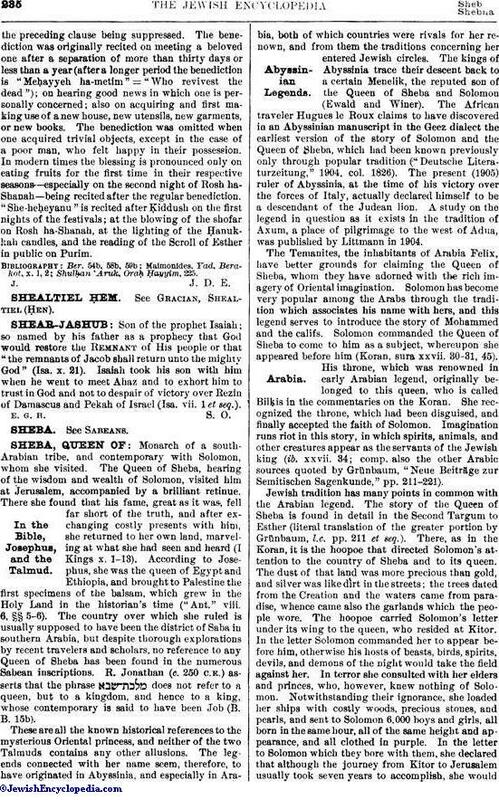 The African traveler Hugues le Roux claims to have discovered in an Abyssinian manuscript in the Geez dialect the earliest version of the story of Solomon and the Queen of Sheba, which had been known previously only through popular tradition ("Deutsche Literaturzeitung," 1904, col. 1826). The present (1905) ruler of Abyssinia, at the time of his victory over the forces of Italy, actually declared himself to be a descendant of the Judean lion. A study on the legend in question as it exists in the tradition of Axum, a place of pilgrimage to the west of Adua, was published by Littmann in 1904. The Temanites, the inhabitants of Arabia Felix, have better grounds for claiming the Queen of Sheba, whom they have adorned with the rich imagery of Oriental imagination. Solomon has become very popular among the Arabs through the tradition which associates his name with hers, and this legend serves to introduce the story of Mohammed and the califs. Solomon commanded the Queen of Sheba to come to him as a subject, whereupon she appeared before him (Koran, sura xxvii. 30-31, 45). His throne, which was renowned in early Arabian legend, originally belonged to this queen, who is called Bilḳis in the commentaries on the Koran. She recognized the throne, which had been disguised, and finally accepted the faith of Solomon. Imagination runs riot in this story, in which spirits, animals, and other creatures appear as the servants of the Jewish king (ib. xxvii. 34; comp. also the other Arabic sources quoted by Grünbaum, "Neue Beiträge zur Semitischen Sagenkunde," pp. 211-221). Jewish tradition has many points in common with the Arabian legend. 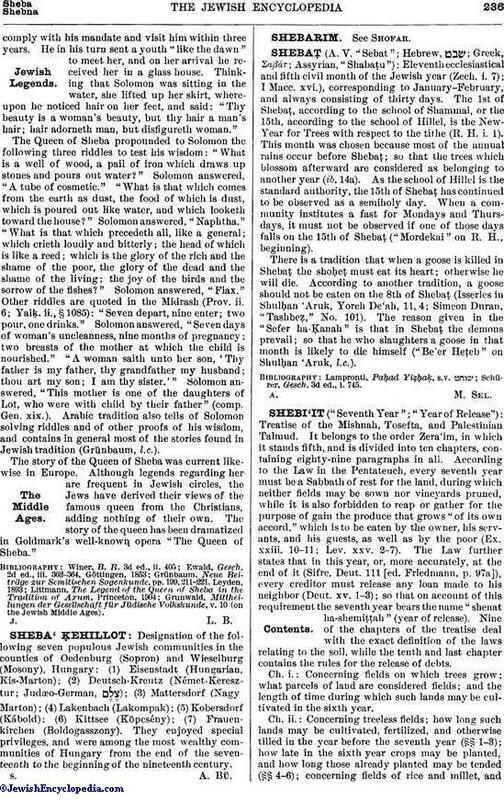 The story of the Queen of Sheba is found in detail in the Second Targum to Esther (literal translation of the greater portion by Grünbaum, l.c. pp. 211 et seq.). There, as in the Koran, it is the hoopoe that directed Solomon's attention to the country of Sheba and to its queen. The dust of that land was more precious than gold, and silver was like dirt in the streets; the trees dated from the Creation and the waters came from paradise, whence came also the garlands which the people wore. The hoopoe carried Solomon's letter under its wing to the queen, who resided at Kitor. In the letter Solomon commanded her to appear before him, otherwise his hosts of beasts, birds, spirits, devils, and demons of the night would take the field against her. In terror she consulted with her elders and princes, who, however, knew nothing of Solomon. Notwithstanding their ignorance, she loaded her ships with costly woods, precious stones, and pearls, and sent to Solomon 6,000 boys and girls, all born in the same hour, all of the same height and appearance, and all clothed in purple. In the letter to Solomon which they bore with them, she declared that although the journey from Kitor to Jerusalem usually took seven years to accomplish, she wouldcomply with his mandate and visit him within three years. He in his turn sent a youth "like the dawn" to meet her, and on her arrival he received her in a glass house. Thinking that Solomon was sitting in the water, she lifted up her skirt, whereupon he noticed hair on her feet, and said: "Thy beauty is a woman's beauty, but thy hair a man's hair; hair adorneth man, but disfigureth woman." The Queen of Sheba propounded to Solomon the following three riddles to test his wisdom: "What is a well of wood, a pail of iron which draws up stones and pours out water?" Solomon answered, "A tube of cosmetic." "What is that which comes from the earth as dust, the food of which is dust, which is poured out like water, and which looketh toward the house?" Solomon answered, "Naphtha." "What is that which precedeth all, like a general; which crieth loudly and bitterly; the head of which is like a reed; which is the glory of the rich and the shame of the poor, the glory of the dead and the shame of the living; the joy of the birds and the sorrow of the fishes?" Solomon answered, "Flax." Other riddles are quoted in the Midrash (Prov. ii. 6; Yalḳ. ii., § 1085): "Seven depart, nine enter; two pour, one drinks." Solomon answered, "Seven days of woman's uncleanness, nine months of pregnancy; two breasts of the mother at which the child is nourished." "A woman saith unto her son, 'Thy father is my father, thy grandfather my husband; thou art my son; I am thy sister.'" Solomon answered, "This mother is one of the daughters of Lot, who were with child by their father" (comp. Gen. xix.). Arabic tradition also tells of Solomon solving riddles and of other proofs of his wisdom, and contains in general most of the stories found in Jewish tradition (Grünbaum, l.c.). The story of the Queen of Sheba was current likewise in Europe. Although legends regarding her are frequent in Jewish circles, the Jews have derived their views of the famous queen from the Christians, adding nothing of their own. The story of the queen has been dramatized in Goldmark's well-known opera "The Queen of Sheba." Grunwald, Mittheilungen der Gesellschaft für Jüdische Volkskunde, v. 10 (on the Jewish Middle Ages).